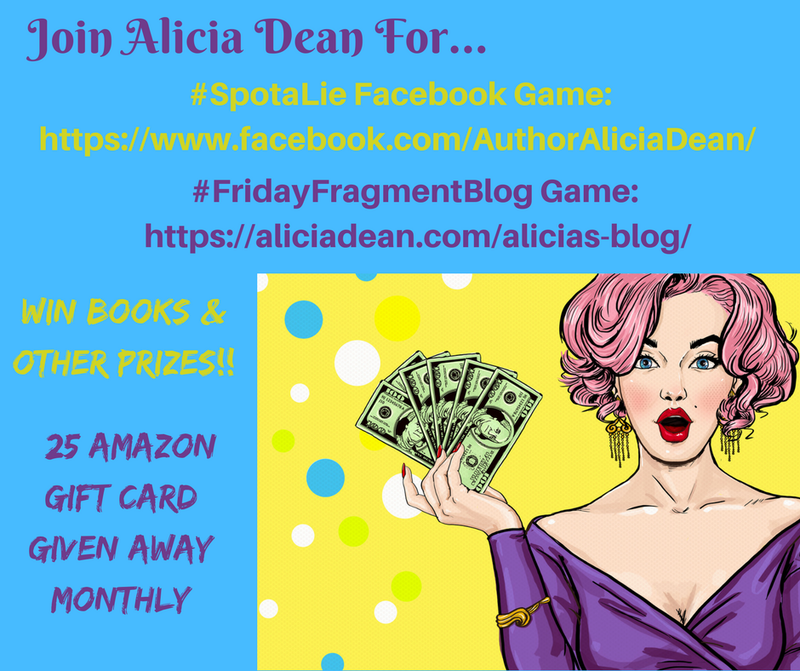 Guess the fragment, and enter to win a $25 Amazon Gift Card!!! NOTE – This is the last Friday Fragement spot. There will be one more SpotaLie spot on my Facebook page this Sunday, and I will draw my final winner on Monday, May 1st —– Beginning in May, rather than these two regular postings, I will have random games and give various prizes, rather than one monthly prize. Sometimes it will be a 5 or 10 dollar gift card, sometimes other items. This way, more participants have a chance of winning. Thank you to all the authors and readers who have played along with these fun games. Check my Alicia Dean Friends and Fan Club group for info and the new games. *** This game runs from the day it’s posted through Sunday, April 30th at midnight, so feel free to send your guesses in and comment any time. He cleared his throat. It pulled me away from studying him. His blue eyes were questioning. The small space that separated us suddenly felt oppressive. If I had it my way I would say my goodbyes to Sam and head back to sunny California, without laying out any skeletons. As I stood in front of him, I knew he wouldn’t allow that. It wasn’t Liam’s style. His gaze told me he understood what couldn’t be said. Not here. Not now. But soon. 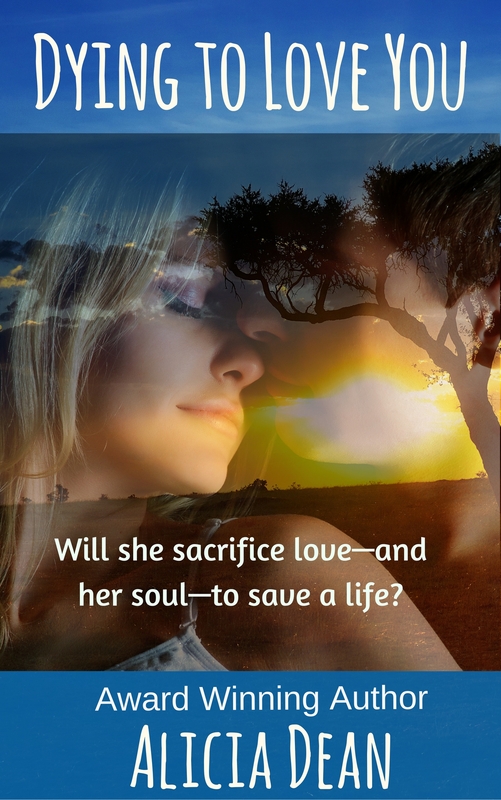 His fingers closed around my elbow, and a jolt of hot, potent electricity shot up my arm. Taking a few sips of my latte, I looked around. Bingo, there he was. My inspiration for the day. He had an intense look on his face, which was odd since it appeared that he was only skimming through the pages of a book. His skin was olive and his strong jaw gave me visions of him whispering commands that I would be all too keen on obeying. Picking up my pencil, I opened to a clean page in my book and started sketching his face. I noticed the light stubble on his chin. [She] turned to [him], uncertainty a sharp claw in her stomach. His fierce glare stopped her. For an instant she stood transfixed by his glower; an odd warmth joined the uncertainty prickling beneath her skin. He nodded. Then Sam’l and Oscar each grabbed an arm to help him. Good Lord, his large body filled the small space. How had she ever had the nerve to leap onto his back and wrestle him from his horse? A flash of self-preservation made her raise her chin. It was his own fault for having such wide shoulders. They made a perfect landing spot. He must cure [her] of her youthful hero worship, for her own good. He scrubbed a palm against his aching chest. There would never be another woman for him. Ever. Especially one whose smiles could light up a man’s heart. If only he possessed one. China’s fingers could barely function as she punched in Miles’ number. Before she completed the digits, the phone shrilled in her hand. She jumped and almost dropped it. The caller ID showed her home number. Dear God. Who was at her house? His explanation was less than satisfactory. Too vague. Something in his tone made her feel he wasn’t being completely honest. I guess that makes two of us. Thanks for featuring my book, Alicia. What a fun game! Whoops! Sorry, forgot to come by. Thanks so much for such a fun game, Alicia, and thank you to all of the authors who have shared snippets of their lovely stories.